Hello! Happy Wednesday! Oh man, I am so ready for spring. Last week we were teased with near 60degree weather. That was so awesome! The mountains of snow were finally starting to melt... Fast forward one week-- more snow. Okay, so yesterday was a mere dusting compared to the nearly two feet we received a few weeks ago, but seriously? I am so so so tired of the snow and cold weather. I did see a little robin outside my apartment last week so that gives me hope that spring is just around the corner.... 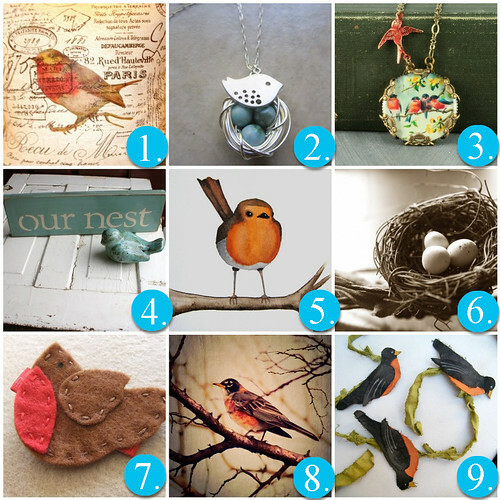 I hope you enjoy some of the awesome robin-themed finds from across etsy! I hope spring is starting in your neck of the woods! Thanks for checking out all these great etsy shops!!! Have a great day!